KastKing® brings space age technology to fishing tackle with the high speed Stealth carbon baitcasting reel. Stealth is made with the same carbon fiber technology, which is stronger and lighter than steel or aluminum used in aerospace, military aircraft, and extreme performance racecar manufacturing. This low profile baitcaster is durable in every aspect with: 4 disk carbon fiber drag system with 16.5 lbs. / 7.5 kg of trophy fish stopping drag, 11+1 high performance anti-corrosion deep-race bearings, braid line ready ceramic guide insert, and a unique industry-leading 7 magnet backlash reducing magnetic braking system match with a fully adjustable 4-pin long standing centrifugal brake for ultimate cast control. It tips the scales at a mere 6 ounces for extended fishing comfort combined with jet fighter performance. Stealth’s cross drilled whiffle style aircraft-grade CNC aluminum spool spins effortlessly to let baits fly farther. With technology for smooth gear performance taken from KastKing’s highly successful Royale Legend, the Stealth uses smooth mesh precision ground, weight reducing forged aluminum gears in its high speed 7.0:1 gear ratio drive. Stealth low profile baitcasting reels are 100% corrosion resistant and come with a one-year recreational fishing warranty. A Stealth carbon matrix baitcaster is a tactical upgrade from an ordinary conventional graphite or aluminum baitcasting fishing reel at the price that every angler can afford. For a stealthy presentation for finesse fishing, punching or frogging for bass, load a Stealth baitcaster reel with KastKing braided line for a perfect baitcasting combo. Cast into the future with a “Top Gun” KastKing® Stealth Baitcaster! Carbon Handle with EVA KnobSUPER LIGHT WEIGHT – Let’s you fish all day long and cast hundreds of times without fatigue. 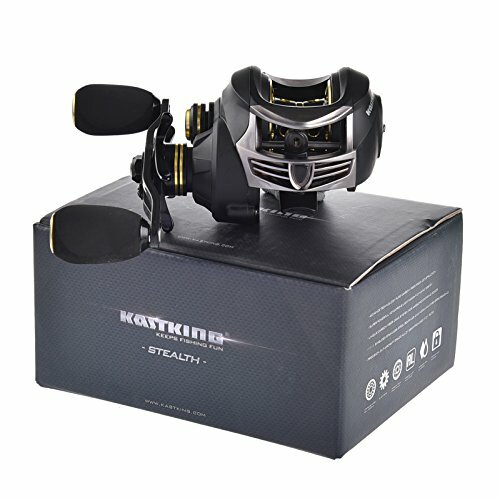 A KastKing® Stealth baitcasting reel weighs only 6 ounces. POWERFUL – Stealth’s 16.5 lbs / 7.5 kg dynamic drag system with 4 carbon fiber disks and hardened aluminum washers gives you whopper-stopping drag power. SMOOTH – 11 anti-corrosion shielded ball bearings made from the finest bearing steel plus an instant-stop one way bearing clutch system delivers the smoothest performance and lightning fast hook sets. PEAK PERFORMANCE 7.0:1 Gear Ratio, hardened forged aluminum alloy gears, aerospace construction solid carbon frame, aircraft-grade aluminum components, carbon fiber handle, braided line ready ceramic line guide insert, sure-grip EVA knobs to give you the highest performance and strength. Stealth baitcasting carbon construction reels are 100% corrosion resistant. UNIQUE BRAKING – Tournament-ready 7 magnet dual brake system combines the best of centrifugal and magnetic braking. The Stealth baitcaster reel’s unique braking system is accessed through an easy open side hatch cover.